Without the right tools, digging holes can be time consuming & expensive even for the most skilled tradesman. At Edisons, you can easily avoid these problems with our refined range of affordable, durable and easy-to-use post hole diggers. 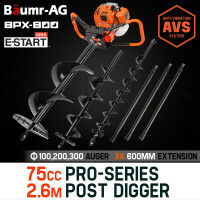 The Baumr-AG Pro-Series Post Hole Diggers are high output powerhouse machines, engineered for great manoeuvrability and low fatigue. 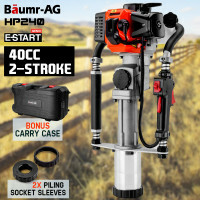 Perfect for both commercial and industrial digging needs, these products have a superior drilling depth 1.6m – 3.4m, backed by 62cc to 86cc motors. Each of these diggers uniquely combines high tensile gear set a large capacity fuel tank and a full size commercial straight drive. 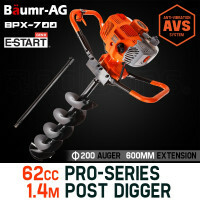 Baumr-AG Post Hole Diggers are perfect for creating holes for general construction, planting trees, plumbing, retaining walls, decking supports and fence posts. 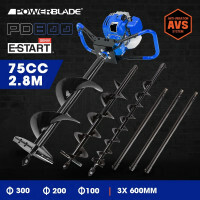 The unparalleled quality of these diggers makes them a must have for handymen, fencers, commercial gardeners and tradesmen. Customer satisfaction is guaranteed by Edisons whenever you buy a post hole digger online, all Edisons products are backed by a 12 month warranty & 3 month commercial warranty. 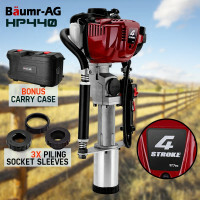 We understand our customers and know that if your intrested in a post hole digger you may be intrested in complimenting products such as top-of-the-line Stump Grinders, Tillers, Spreaders, Trenchers, Fencing and Dump Carts.